WCMA Fall Conference & Plant Tour Event attendees toured seven woodworking facilities as well as the Michigan Career and Technical Center. Pictured is a shot from Davidson Plyforms. 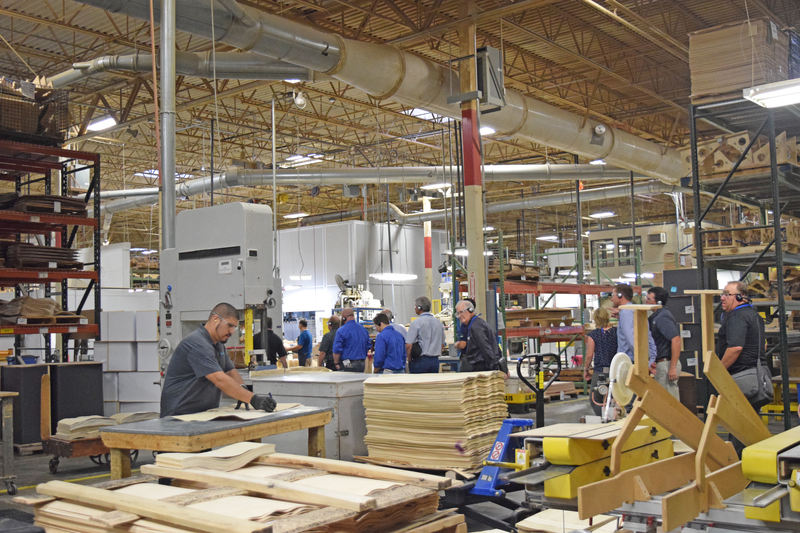 Best practices for manufacturing wood components were shared by more than 100 North American woodworkers and industry suppliers during the annual Fall Conference & Plant Tour Event hosted by the Wood Component Manufacturers Association. Held Aug. 21-23 in the Grand Rapids area, the event included tours to seven local manufacturers of a wide range of products, including curved components, cabinet components, architectural and furniture parts, mouldings and millwork, specialty wood products, and woodworking machinery. With employee recruitment and training a priority, the event also included a visit to the Michigan Career and Technical Center for an inside look at the second largest, state-run rehabilitation center in United States. Tabletop exhibits and presentations by the “Wood Doctor” Gene Wengert, a contributor to FDMC magazine, and Grand Valley State University professor Jaideep Motwani were also featured. What follows are brief highlights from the companies on tour. For information on other WCMA events, including the 2018 Spring Meeting or Fall Conference & Plant Tour Event, visit WCMA.com. 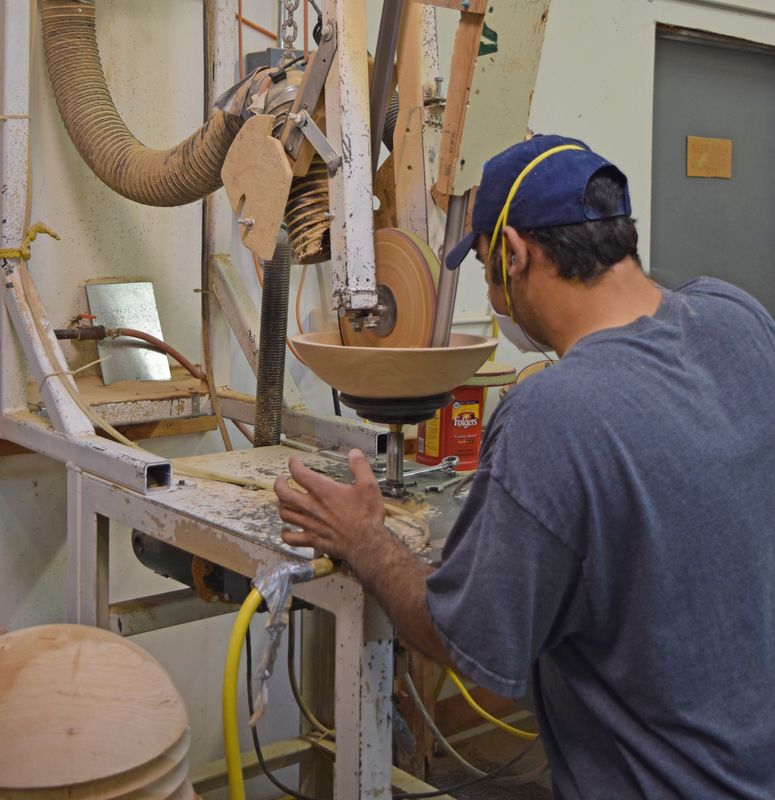 Founded in 1927, Davidson Plyforms specializes in curved and compression molded plywood components. A sustainable manufacturer, the Grand Rapids-based company is committed to investing in technology and the continuous improvement of its manufacturing capabilities, said Doug Britton, director of sales. Inside the 200,000-square-foot plant, Davidson utilizes induction and radio frequency molding techniques along with CNC machining, laser etching and finishing capabilities for manufacturing a range of products including: chair components such as backs, shells, seats and frames; cabinet and overhead door fronts for locking and storage components; compression mold recycled plastic components; and metal Shift height-adjustable tables and kits. To make the molded plywood components, plies of veneer are run through a glue spreader then laid up before being machined into shape. Press time is driven by the thickness and complexity of the part. Plywood veneer blanks are staged in the CNC area for precise machining. 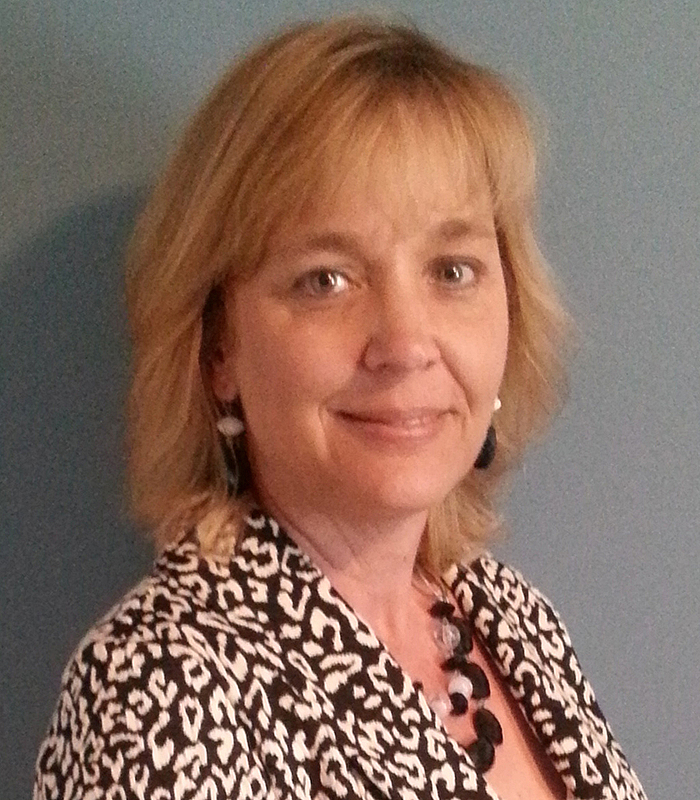 “We try to keep the processes together so we have one-piece flow,” Britton said. The company utilizes 3- and 5-axis CNC machines by Bacci, IMA and an older model Heian. Products are conveyed into a Col-Met spray booth for finishing. “We also work with solid wood as well,” Britton noted. A built-in data system helps Davidson Plyforms track jobs as they move through the shop. Part of Leggett & Platt’s Work Furniture Group, Davidson Plyforms has approximately 300 employees. The largest commercial wooden bowl producer in the United States, Holland Bowl Mill manufactures 800 to 1,000 solid wooden bowls weekly using a variety of hardwood species including beech, maple, walnut and cherry, said David Gier, president. The company, which traces its roots back to 1926, has been featured on The Discovery Channel’s How It’s Made. Inside the 18,000-square-foot facility in Holland, Michigan, logs are cut into blocks and inspected for flaws. A ripsaw then cuts the block into optimal bowl size blanks, which are then machined on a lathe in a nesting process. Curved knives are used to remove the exterior bark shell and sculpt the surface and thickness. A smaller curved knife simultaneously creates the inside wall of the larger bowl and the outer shell of the next size bowl in a continuous process. The bowls are steamed for approximately 4 hours to “cook the sap” and air dried before sanding, explained Gier. A special knife shaves the bottom flat and the bowl can be custom engraved, painted or otherwise finished. As a final step, the bowls get a bath of food-safe mineral. 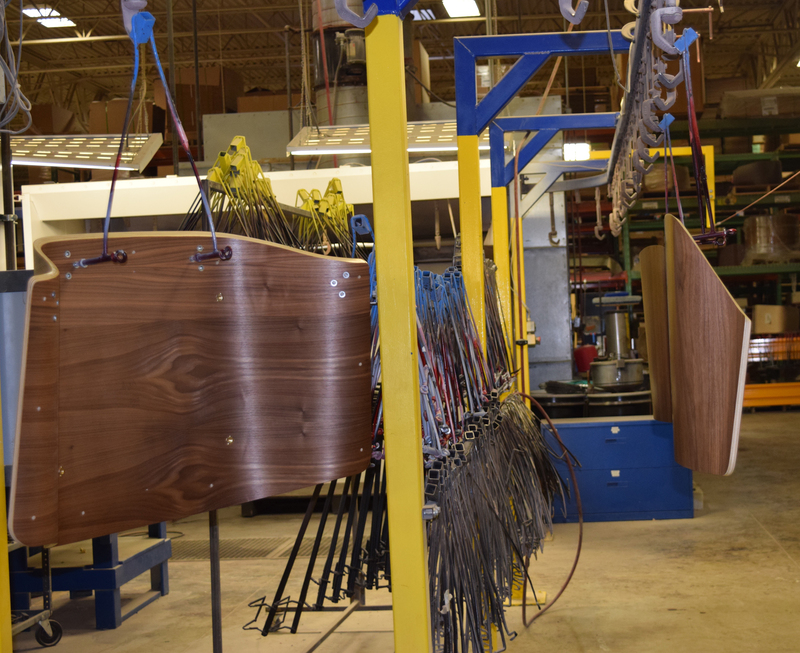 Although it also produces children’s furniture, the focus at Great Lake Woods was on its custom wood parts, wrapped profiles and wood mouldings. According to owner Keith Malmstadt, the company’s strengths are in its creativity, capabilities, production quality and on-time delivery. The company processes more than 1,000,000 lineal feet of moulding per week through its bank of Weinig CNC moulders. Great Lake Woods also utilizes specialized equipment, such as automatic double miter saws, custom CNC routers and rope machines. 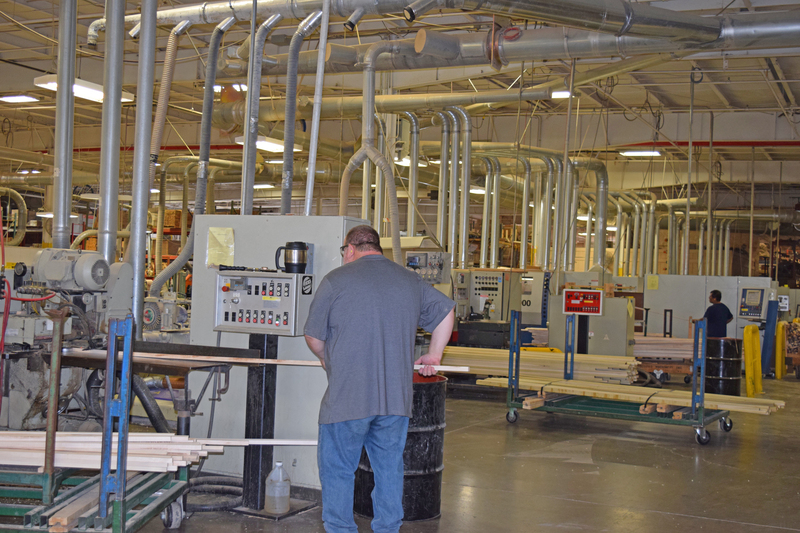 Production in the 100,000-plus-square-foot facility starts in the rough mill area where ripsaws and optimizing double miter saws are used with Weinig CNC moulders to produce a wide range of profiles – as well as textured mouldings – for cabinetry and other products. With its ability to create tooling in-house, the company can custom craft new profiles quickly and easily, noted Andy Watson, account manager. The use of tenoners enables the company to manufacture long mouldings “with greater strength and less expense.” Additional capabilities at the plant include CNC machining, sanding, profile wrapping and assembly, using C.R. Onsrud 3- and 5-axis routers, a Duramac widebelt sander, Barberan profile wrapper, and Doucet and Taylor clamping stations. 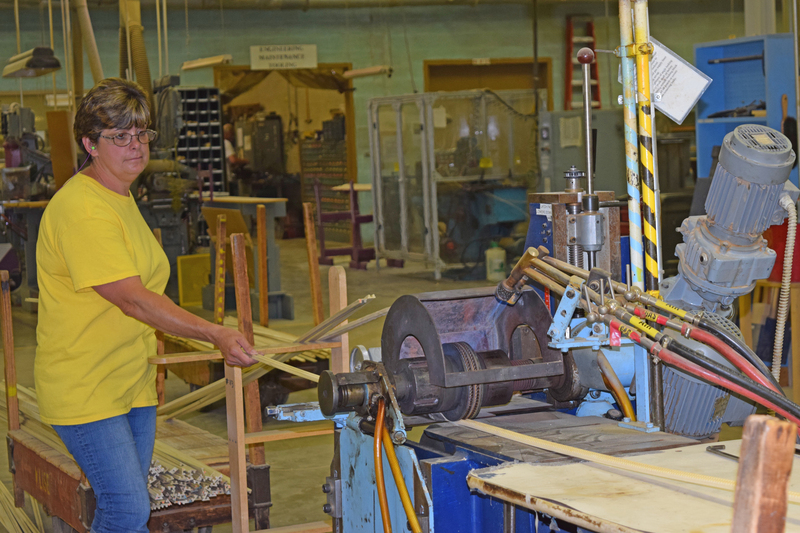 Throughout Klise Mfg.’s 107-year-old history, the core focus has been on carved wood. The same holds true today, as the Grand Rapids-based manufacturer continues to combines old world craftsmanship with CNC to create carved and embossed lineal mouldings from domestic and exotic wood species. In addition to custom offerings, Klise has a library of more than 6,000 patterns, including: embossed acanthus leaf, basket weave, carved bead and bamboo, circle themes, curved corners, dentil, egg and dart, grape, embossed and carved flowers, lunettes, curved and carved flutes, gadroon, Greek key, embossed guiloche, laurelling, chevron and herringbone. Applications are limitless, and include high-end furniture, interior designs and architectural projects. The mouldings are made to order, using a variety of machines including: Omga saws, a Centauro copy lathe, Borgonova notcher, Heian CNC router, Mattison moulder and a Universal Laser engraving system. The company also produces its own dowels and has the capability to manufacture tubes. Another specialty of Klise is hand woven, custom wire mesh grillwork for the cabinet, residential and commercial furniture industries. The company has 20 employees at the 90,000-square-foot facility. Howard City-based Michigan Chair Co. is in the unique niche of steam bending. Founded in 1946, the company custom bends wood for high-end contract and residential furniture manufacturers ranging in size from large multinational companies to one-man shops. A benefit of steam bending is that it can help solve short grain issues, resulting in stronger parts, said co-owner Tim Hoolsema. 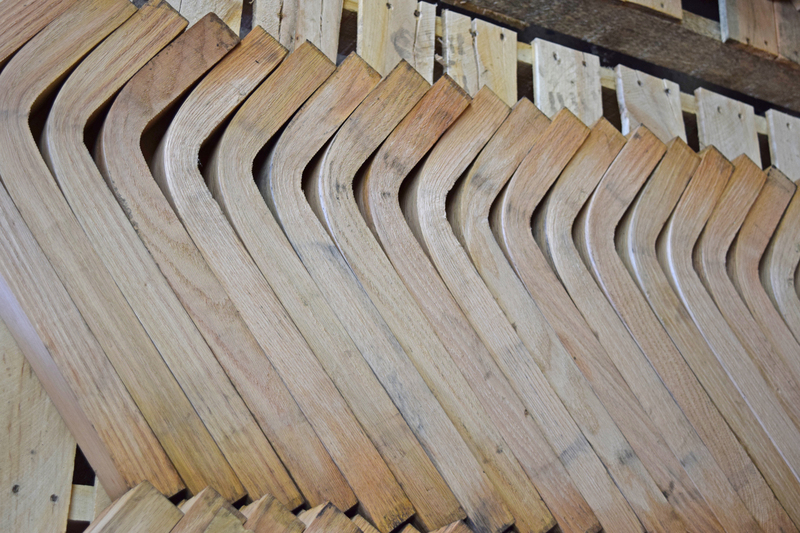 Michigan Chair’s specialty is the bending of 6/4, 8/4 and 10/4 thicknesses of hardwood. Starting at 12 to 13 percent moisture content, the lumber is milled, steamed and formed into shape, then dried to 6 to 8 percent. It’s a precise process: If done too quickly, cracks result, but if steamed too long, the form can fold or result in bad checking. “Think of steaming like cooking pasta,” Hoolsema added. In addition to its bending equipment, the shop also has a moulder for surfacing, gang saw with removable blades, and a double-end trim saw for cutting and squaring of the ends. Based in Kentwood, Paladin Industries manufactures complex 3D custom machined and laminated components for use in the office furniture, store fixture, automotive and other industries. Thousands of parts are produced daily, noted Alan Applegate, vice president of business and development. 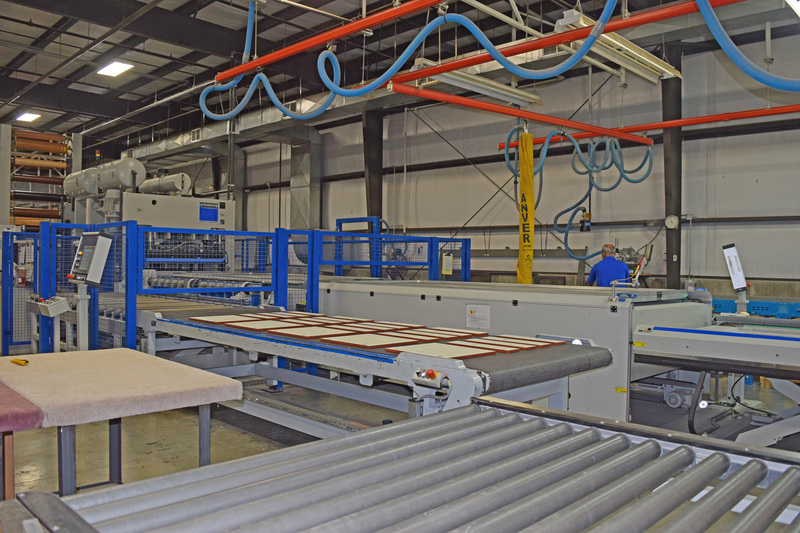 Inside the 84,000-square-foot facility, the company utilizes a variety of high-tech equipment, including: 14 CNC routers, a CNC panel saw, Wemhoner membrane presses, a Burkle PUR laminating line with automated material loading and handling, and a Homag airTec system on the edgebander for virtually seamless edges. Designed for flexible manufacturing, the plant also has in place an IntelliStore material handling system for automatic retrieval and storing of the sheet stock. Quality and customer service are a priority. Among the features in place at Paladin is a humidity controlled clean room for PUR lamination, which can be critical when it comes to pressing high-gloss. The company also has sanding and finishing capabilities, with three GFS in-line spray booths in a closed loop system. A sustainable manufacturer, Paladin has several environmental initiatives in place, including the use of an Eco Gate dust collection management system, high-efficiency lighting, and zero hazardous waste. Founded in 1985, the company has approximately 30 employees and is a past winner of the WMIA Wooden Globe Award for Innovator of the Year. Attendees also toured the facility of Stiles Machinery, a leading supplier of solid wood and panel processing technology in North America. 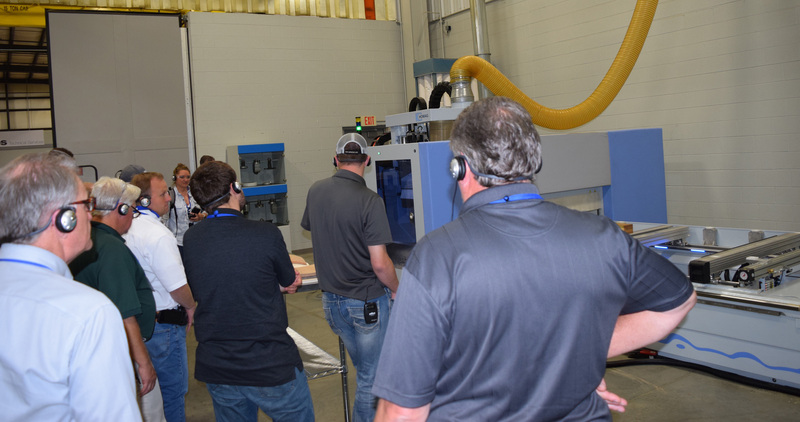 Along with a presentation on Stiles University, the company’s education and training initiative, there were machinery demonstrations and a close-up look at the parts department and shipping operation. As part of its Total Production Solutions approach, Stiles also offers equipment integration and financial services. Founded in 1965 and headquartered in Grand Rapids, Stiles has regional offices in High Point, North Carolina; Bristol, Pennsylvania; Coppell, Texas; and Rancho Cucamonga, California. The company is a member of the Homag Group.